Before heading out to Trick-or-Treat, help ensure your child’s safety by reviewing these Halloween safety tips together, and by choosing Halloween costumes that maximize both your child’s safety….and fun! In the nighttime excitement, young children can quickly forget even the most basic safety rules. Enjoy a good scare together, and keep child safety a priority this Halloween. Don’t be scared…..Talk to your kids about Halloween safety! Keep the fun, but take an moment to review the safety rules together. Always use sidewalks and crosswalks, especially on Halloween. Do not run or play chase in the dark. Children under the age of 12 should not trick or treat alone without adult supervision. If kids are mature enough, remind them to stick to familiar, well-lighted areas and to travel in groups. Adults should examine all treats before the kids eat. Discard open wrappers, expired products, or anything that looks suspicious. 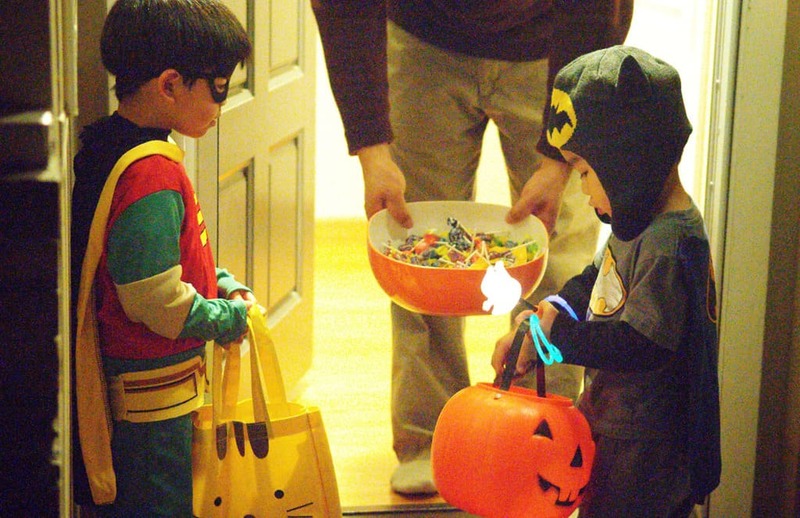 Children with nut allergies should avoid eating all passed-out candies, as even those without nuts may have come into contact with nut products when distributed. Do not obstruct vision; tie hat or scarfs securely. Costumes, wigs, and beards should be flame resistant. Carry a flashlight or glow stick to see and be seen. 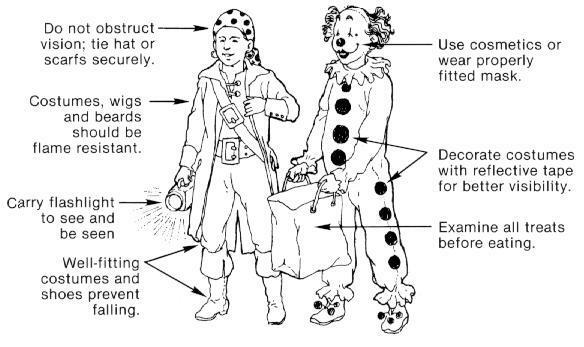 Use well-fitting costumes and shoes to prevent falling. Since masks can obstruct a child’s vision, try non-toxic face paint whenever possible, or wear a properly fitted mask. Decorate costumes with reflective tape for better visibility, and if possible, choose a light colored costume. What to Do with Your Extra Halloween Candy? 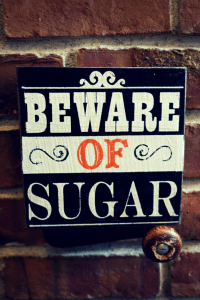 Do kids really need pounds and pounds of excess sugar? Is too much candy a good thing?!? Halloween is a great time to talk with children about the meaning of moderation, over-indulgence, and excess. Establish a “Family Candy Policy”. Offer to exchange your child’s Halloween Candy for new books, or even cash! $1 per pound seems to be a good going-rate for 2014! Community Fundraisers: Some community organizations offer to exchange candy toward a donation at your local school. 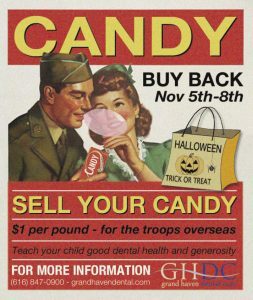 Halloween Candy for the Troops, such as through Operation Gratitude……or even better, skip the candy, and send a thank you card, or wish-list item to our troops! Consider making some homemade treats for a Post-Trick-or-Treating-Halloween-Bash back at home. Start a family tradition of roasting pumpkins seeds or eating a slice of homemade pumpkin pie, rather than over-gorging on candy.